So I admit that we’ve been pretty bad slackers about posting new recipes lately. I suppose that’s just what happens when you combine summer with jobs, more babies, interstate moves, potty training, the list goes on. But fear not, we’re still alive and cooking (even if we’ve got some standby recipes on repeat) and experimenting with some new things when we can. This recipe is my most recent experiment with bear meat. Of course, most people don’t have bear hanging out in the fridge and that’s totally fine – beef, pork shoulder or other wild game would work great as well. This one is inspired by this delicious “globally-inspired” taco place by my house and adapted from this recipe. It’s a nice little way to mix up your ho-hum taco night without too much extra effort. Place roast in a glass baking pan. Scatter apples and green onions on and around roast in pan. Combine soy sauce, vinegar, oil, honey, garlic, ginger and pepper, then whisk well to combine. Pour marinade over meat and vegetables. Marinate overnight. In the morning, transfer roast and marinade to a slow cooker. Add water one cup at a time until the roast is 1/2 to 3/4 covered with liquid. Slow cook on low for 6-8 hours. 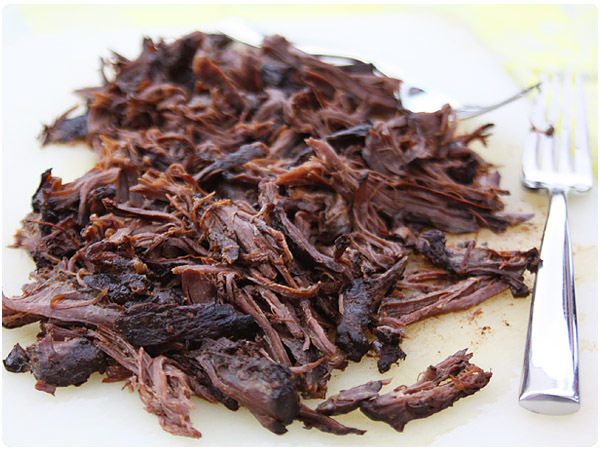 Once meat is tender and falling apart, remove roast from slow cooker and gently shred with two forks. Prepare cabbage, apple, carrots and radishes and combine in a medium bowl. Add cilantro and toss to combine. Whisk together lime juice, oil, cumin and salt and pour over slaw mixture. Toss again to combine. Slaw don’t need to be exact – make your slaw to taste and for the appropriate amount of people you’ll be serving. Set aside. In a small bowl, whisk together sriracha sauce and mayo, adding sriracha until you reach your preferred heat level. 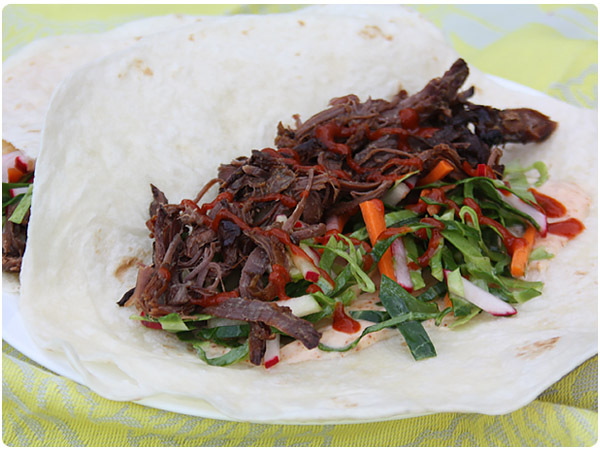 Assemble tacos by spreading sriracha mayo on each tortilla and topping with meat and slaw. Drizzle with additional sriracha if desired. A few years ago, the hubs pulled a black bear tag and, lo and behold, came back from his hunt with well over 100 pounds of bear meat. This was the year we were getting married and had just bought a house and funds weren’t exactly free-flowing so I took it as my mission to take his “gift” and make the most of it in free meals (this is what love looks like, people). Some of the things we tried left a bit to be desired (ahem, bear ribs) but others, like this recipe below were pretty fantastic. 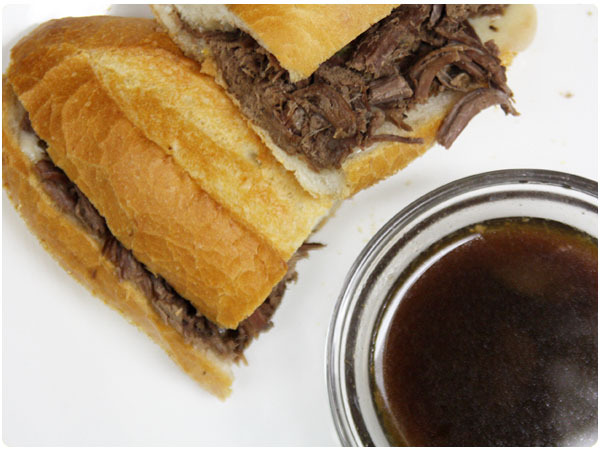 This year, another bear ‘showed up’ in my freezer and I was actually quite excited to bust back out the slow cooker and make this version of a hearty French Dip Sandwich. Of course, most people don’t just have bear at their disposal but this would be just as wonderful with a beef roast. 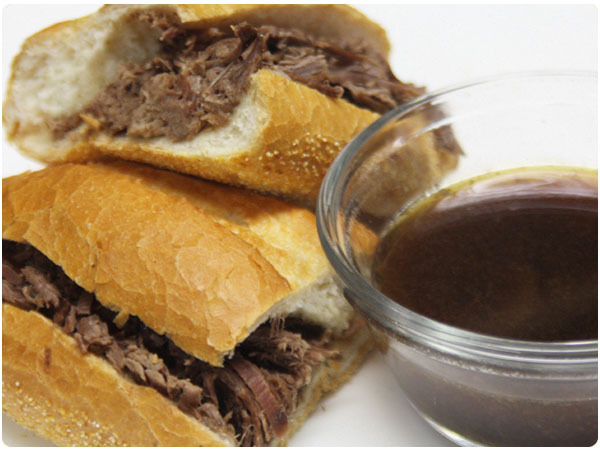 Place roast in a slow cooker. Pour beef consomme, french onion soup and beer over meat. Add Worcestershire, garlic and cracked pepper. Toss in bay leaf, rosemary and thyme. 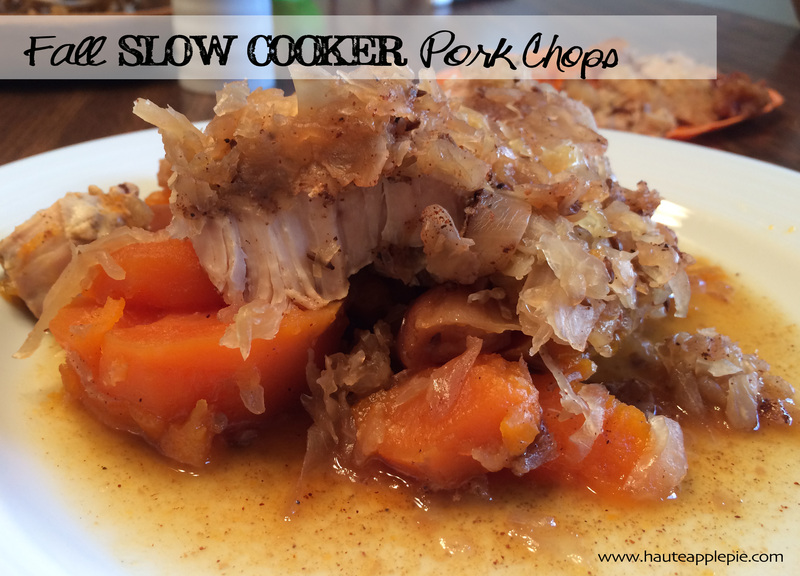 Slow cook on low for 8-9 hours or on high for 4-5 hours until meat is very tender. Remove meat from slow cooker and shred or slice thinly, depending on meet you’ve chosen. 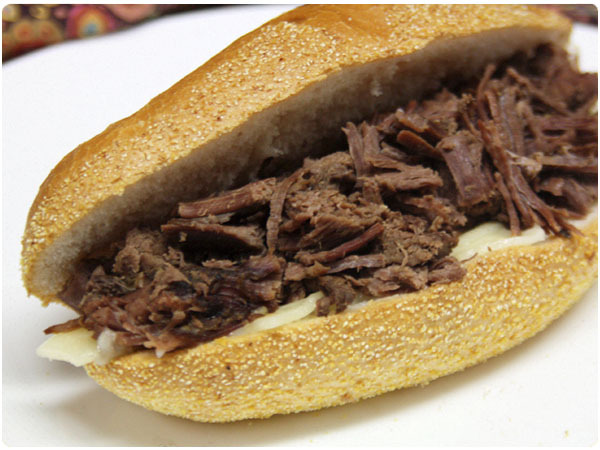 Place meat on sliced French rolls and top with a slice of swiss cheese. Microwave for about 30 seconds to just melt cheese. 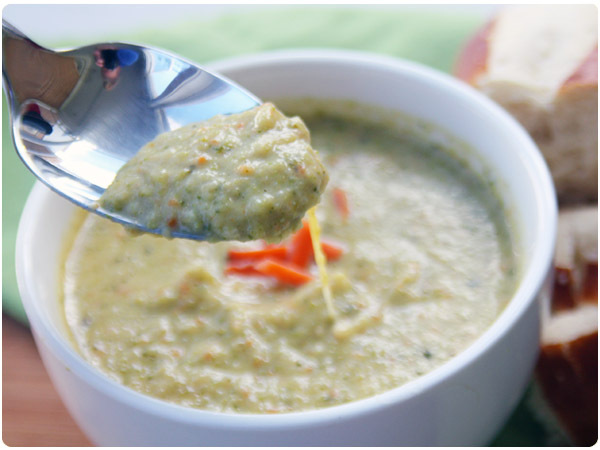 Ladle jus from the slow cooker into a small bowl for dipping to serve. Have you ever have a favorite lunch or dinner place that you max out on or move further away from and then totally forget about for awhile? Then one day something trips a magical memory trigger and you suddenly ask yourself why it’s been forever since their deliciousness has crossed your path? This happened to me recently and in my case, it’s an extremely tiny and eclectic soup place. A Milwaukee “soup Nazi” of sorts that I worked by for years until my career took me around town for a few years to offices far from his shop. When I moved back to a downtown office almost two years ago, I had all but forgotten about the place – until a few weeks ago. It was one of those first grey, gloomy and freezing pre-winter days and a Whole Foods salad just wasn’t going to cut it. I needed warm, hearty soup and BOOM, memory trigger tripped. 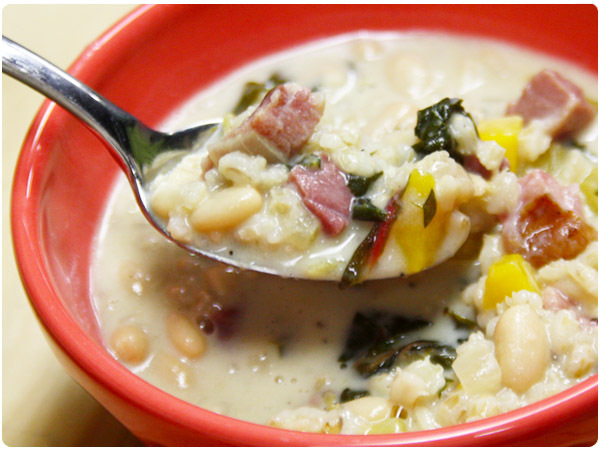 I ordered a Northern Bean and Ham Soup and couldn’t stop thinking about it so I took my own riff on recreating it for home – swapping his rice for barley and tossing in a few more vegetables from the remains of my CSA. Now, even though I’ll be going back again soon, I’ve got a permanent reminder in my files. Prep and chop all vegetables. 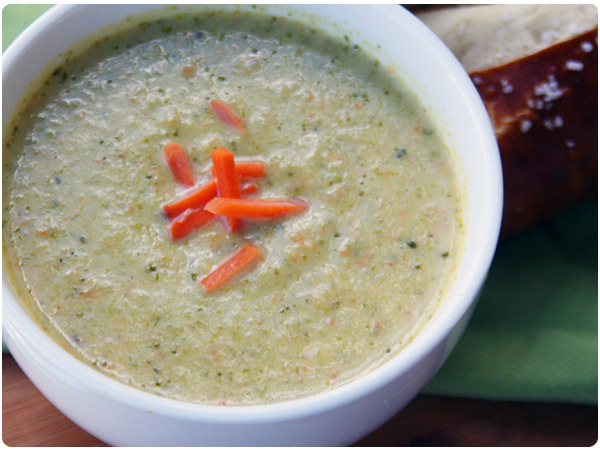 Melt butter in a large stock pot and once almost melted, add onion, carrot and celery. Saute vegetables over medium heat for 6-8 minutes. Season well with salt and pepper. Once they begin to soften, add garlic and saute another 3-4 minutes. Add small amounts of chicken stock as needed if vegetables begin to stick to the pan, using a wooden spoon to scrape any browned bits off the bottom into the stock. Add ham, beans, barley and remaining stock. Stir to combine and reduce heat to a low simmer. Cook for 20 minutes, then add kale/chard and half and half. Continue to simmer for another 30 minutes, checking to see that barley is fully cooked. Season well with salt – about 1-2 tsp – until flavors pop. I’m a soup kinda gal. 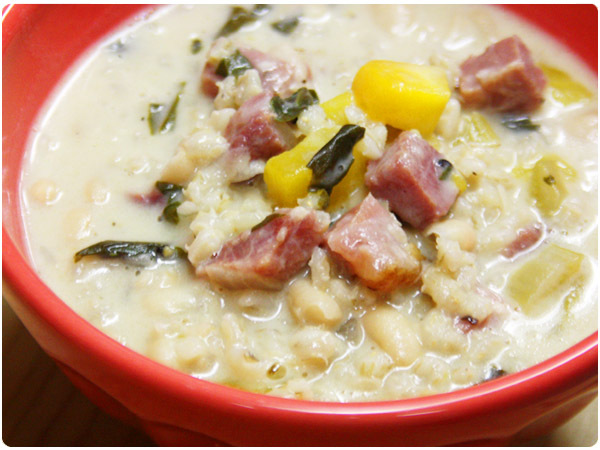 Come fall and winter it’s one of those perfect dishes that warms you up and feels so seasonally right. When your house is as hectic as mine, the fact that it makes great leftover lunches and freezes like a dream makes it even more ideal. 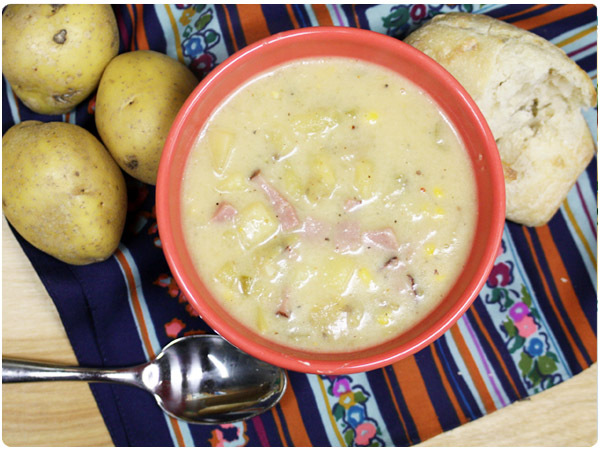 This Ham and Potato Chowder is rich, creamy, savory and just salty enough to leave you wanting just a few bites more when your bowl is empty. In a stock pot, melt butter over medium heat. Add onion and celery and cook until vegetables begin to soften, about 5 minutes. Season with salt and pepper. Whisk in flour, which will form a bit of a paste on the vegetables. Add 1 cup of chicken stock and continue whisking to thicken stock and smooth out flour paste. Season with Old Bay. Continue whisking in the remainder of the stock. 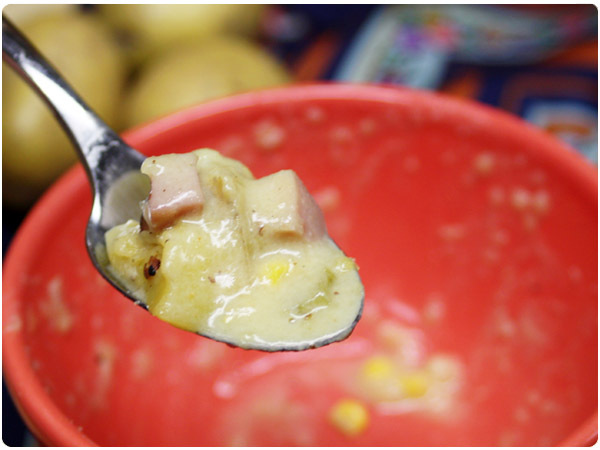 Whisk in sherry and milk, then add in potatoes and ham. Reduce heat and let soup simmer for 45 minutes. Add in corn, pepper and additional salt to taste. Simmer for another 10-15 minutes. 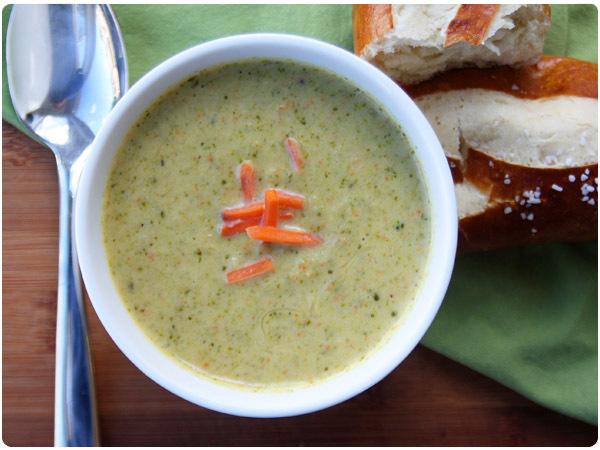 Want more winter soup recipes? Look no further than HAP’s soup stash.